This is a recipe my sister used when we visited the once. She does have a way with cooking that I've never had. I liked this one. ..
Makes about 3 quarts or 10 to 12 servings of an exceptionally good Black Bean soup. .. If I cook too much porridge this is the recipe I will use to use it up. Yum b' yum. I can eat a plateful on my own. ..
A suitable veggie gravy that goes with almost any dish where you would want gravy. ..
We've had both success and failure with this dish, but enjoyed both. It can work well as a main course served with salad, or light vegetables. ..
Big portion recipe for a rather tasty sesame noodles. ..
A tasty alternative to just lemon and sugar on your pancakes. ..
A simple salad that's a little more adventurous than chopped lettuce and tomato. ..
A macaroni cheese recipe that works well for me. Another good vegetarian recipe with pasta at the core. 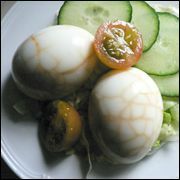 ..
A very, very simple recipe that gives very cool and crazy looking boiled eggs for salads, buffets, picnics and anywhere else you'll want a boiled egg! ..
A very straight forward vegetarian soup recipe, like all pulse recipes it needs forward planning as dried haricot beans need soaking overnight first. A filling, warming soup recipe. ..
A nice change from the usual veggie bolognaise, the mixture of cheeses does offer a very Italian taste sensation. .. I was put off tofu at an early stage in my vegetanariansm, but this is one of the few tofu recipes I can not only cope with, but thoroughly enjoy. .. Excellent veggie egg noodles for to accompany a wide selection of vegetarian dishes and recipes. ..
We all love comfort foods - you know the ones, creamy, thick and rich and they make you feel so good, you want to snuggle up with your bowl and shut out the world .. and its accompanying stress and tension. This smooth, silky barley stew laden with v ..
A potato dish for when you want something plain and a little different. ..
A favorite tea time snack in India, samosa is also a very popular item on the menu in many a Indian restuarant worldwide. Served with mint chutney on the side, this snack is sure to warm all hearts. ..
A different kind of soup to what I believe is a traditional recipe. ..
A real taste from my childhood. I think this is one of those passed down recipes, and I'm glad my Nan wrote it down for me. ..
An old parsnip soup recipe. ..
An interesting side dish for spicier meals, accompanying rice and similar. Works well with a pick and mix meal. ..